iTunes Not Playing Music? Fix It! Have you ever been perplexed by iTunes not playing music problem? For instance, some of your songs in AAC format may not be recognized by iTunes. There are several songs, though in your iTunes library, are skipped without being played for a reason beyond your understanding. There is no sound when switching audio sources after iTunes 12 update. If you are an iTunes user who've faced the iTunes problem with music playback, you will find this guide deserves your attention as it focuses on the reasonable solutions and shares you the best iTunes alternative that aids you to download free music and play it on iTunes iPhone iPad and even Android easily. No matter what causes iTunes not playing songs, you can take this way to solve iTunes music down problem. That is transferring iTunes music to Mac. And to accomplish this task, an excellent music transfer tool is in demand. MacX MediaTrans is a wise choice. Not surprisingly, music manager can transfer music from iPhone to Mac, including iTunes purchases. 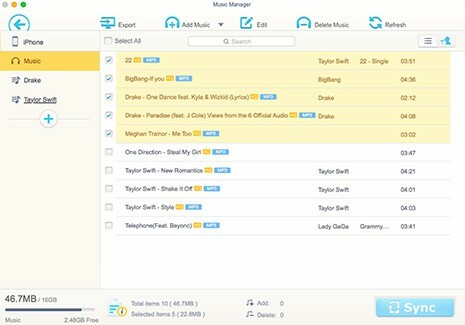 Moreover, it's also a trifle to manage your iOS music, such as adding music playlists, editing detailed music info, deleting unwanted music in batch. Step 1: Free download the iPhone backup software and launch it on your Mac computer. Then connect your iPhone iPad or iPod to Mac with a USB cable. Step 2: Click the "Music Manager" icon to enter the music transfer window. And select your desired iTunes music you wanna transfer to Mac. Step 3: Click "Export" button on the top of the panel to transfer iTunes purchased music from iPhone iPad or iPod to Mac. Within an extremely short time, the iTunes music transferring process would be completed and the problem will be sloved. 1. iTunes won't play music in AAC format: At times your iTunes will not play AAC songs that were not created with iTunes or downloaded from the iTunes Store. This is because iTunes and iPod products only support songs in MPEG-4 AAC format. So when it comes to the free music you download from Internet or other online sites, the downloaded music won't be playing in iTunes. Solution: You just need an iTunes video converter to transcode the song video to MPEG-4 AAC format beforehand and then import the downloaded music to iTunes for playback. To save your time from dredging for the trustworthy video converter software for iTunes, here MacX Video Converter Pro is highly recommended. With 320+ video and 50+ audio codecs embedded, it easily converts any kind of video to iTunes supported format as well as the format that's readable on iPhone, iPad, Android and other mobile devices with lossless quality. BTW, the built-in YouTube downloader allows you to download free music to iTunes from YouTube, Vimeo, Vevo, etc instead of spending additional money on iTunes music downloads. 2. Problem with the number of computers: If you can't play a song purchased from iTunes Store, you may have exceeded the number of computers you can use to listen to the music you purchase. The iTunes not playing music on the sixth computer as the limit is five for DRM protected music. Solution: Open iTunes on the computer you want to deauthorize. Choose Store > Deauthorize This computer. 3. Problem with AirPlay speakers: From time to time, some music videos will only play audio but skip the video in iTunes when you are connecting the music from your iTunes player to Apple TV or else with the AirPlay speakers. Solution: Just turn off the AirPlay speakers so that you can get iTunes music to play with both audio and video. 4. 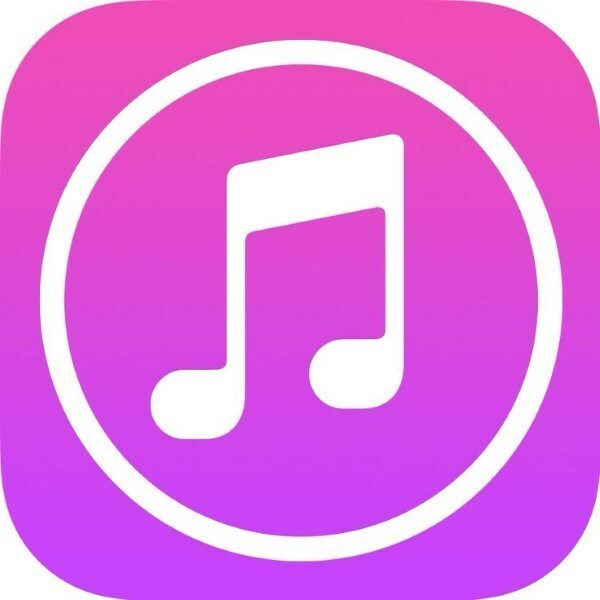 Problem with a shared library or playlist: In case you are listening to a shared playlist or library, iTunes skips any purchased music in the list (if the computer is unauthorized to play this song). Solution: To listen to the purchased song, double-click the song. If your computer is not authorized to play songs purchased by the person who shares the song, please enter that person's Apple ID and password to enjoy the music in iTunes. 5. iTunes won't play or add MP3: iTunes refused to add a song to its playlist and wouldn't play the original source MP3 file, let alone the problem of iTunes not syncing music. Solution: Launch QuickTime Player > Drag or open the MP3 file into QuickTime > select Save As from the File menu > Select iPhone as the format > click Save and let the MP3 file format convert to M4V iPhone movie file > locate the M4V file and rename it as .m4a to ensure iTunes treat it as audio. Solution: For Mac users, please try Application > Utilities > Audio MIDI Setup or Window > Show Audio Window > Select the Built-in Output option OR your audio device and choose 44100.0 Hz from the drop down menu. For PC users, click Advanced > choose 2 Channel 24 bit, 44100 Hz (Studio Quality) from the drop down list > click on Test to check if the sound is audible > click Apply and OK. They your problem of iTunes won't play music can be solved. 7. iTunes won't play a song on a CD: Another savior that helps you play songs on a CD you burn with iTunes is to pay attention to the disc's format. Solution: Make sure the equipment you try to play the CD on is suitable for the disc's format. For instance, you can play the song on your computer and the same newer CD player in case you burn a CD-RW disc. For an MP3 disc, make sure you own a special MP3 CD players instead of a standard consumer audio CD player. Best iOS music transfer to move iTunes music from iPhone iPad iPod to Mac at world's fastest speed. • Manage Music at One Stroke: Easily manage your iPhone music on Mac, adding music playlists, editting music details, deleting unwanted music or album etc.